On October 30, 2018, the results of the second wave of the all-Ukrainian sociological survey “3D-profiles of the presidential election participants-2019” were presented in the press-center of the Interfax-Ukraine News Agency, with the new ratings of the presidential candidates in Ukraine. Full video of sociological research presentation. The survey, conducted by the Centre for Applied Research, a sociological company, was carried out to meet the scientific and public interest and was funded at its own expense by the analytical center “Power Matters”. Sample: all Ukraine, except Crimea and the occupied part of the Donbas (2,100 respondents). Standardized face-to-face interviews, with an average duration of 15 minutes. The statistical error is within 3%. Period of study: October 1-12, 2018. According to the results of the all-Ukrainian poll, the leader of the “Batkyvshchyna” Yulia Tymoshenko has the highest rating among the presidential candidates – 15% (the rating increase is almost twice as much as the first wave). In the second place, the acting head of state Petro Poroshenko – 9.4%. In the third place, the actor and head of the creative group of the “Quarter 95” Volodymyr Zelenskiy – 8%. Anatoliy Hrytsenko lost almost 1.5% and now would receive 6.6% of the vote. Support of the singer Svyatoslav Vakarchuk also decreased – from 4.6% to 4%. The combined rating of Yuriy Boyko and Vadim Rabinovich is almost 10% (5.1% and 4.6% respectively), and in the case of nominating a single candidate, they can compete for the second round. Among candidates who have only recently begun appearing in presidential ratings – 1.6% of support is for Evgeny Murayev, 1% – for Taras Kostanchuk and 0.8% – for Roman Bezsmertny. 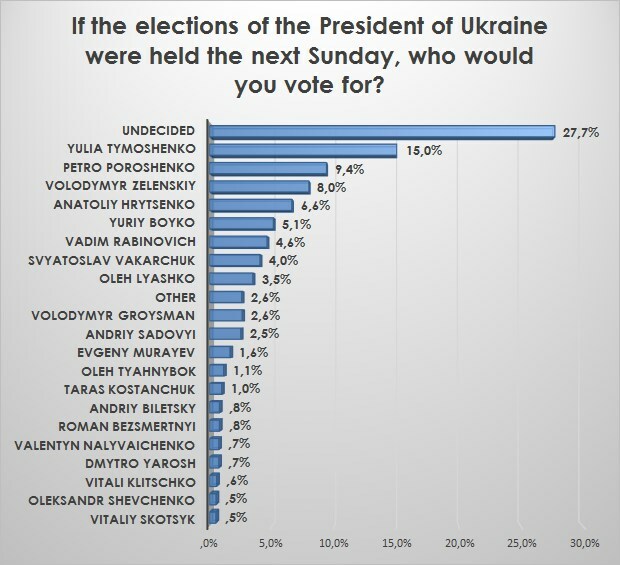 If the elections of the President of Ukraine were held the next Sunday, who would you vote for?